Morinaga’s baked chocolate,“BAKE” has 14 years history on sale. With the licensed technology unique to Morinaga, “BAKE” manages to have contradictory textures between crispy surface and creamy chocolate inside. As a chocolate that doesn’t melt even in summer, it is also a pioneer of a new market in chocolate industry. To utilize the Morinaga’s technology, we’d like you to offer a concept design for a new product that never exists. 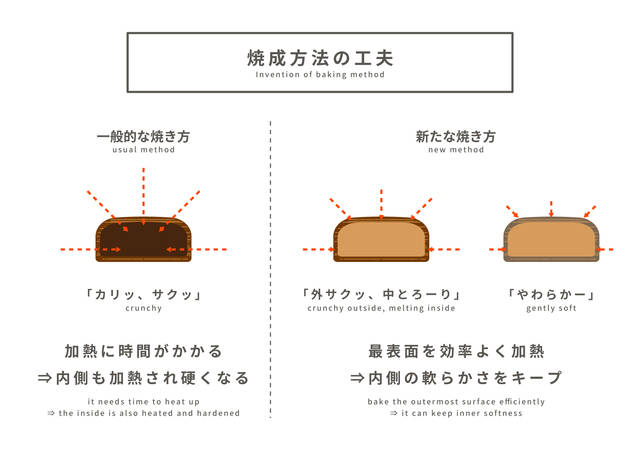 “BAKE”, which is one of Morinaga’s representative products, was actually inspired from the taste of Okoge. After years of R&D, a baked chocolate, “Kongari-shokora(Crispy Chocolate)” was on sale for the first time in 1997. In 2003, it was renewed with the current name as “BAKE”. 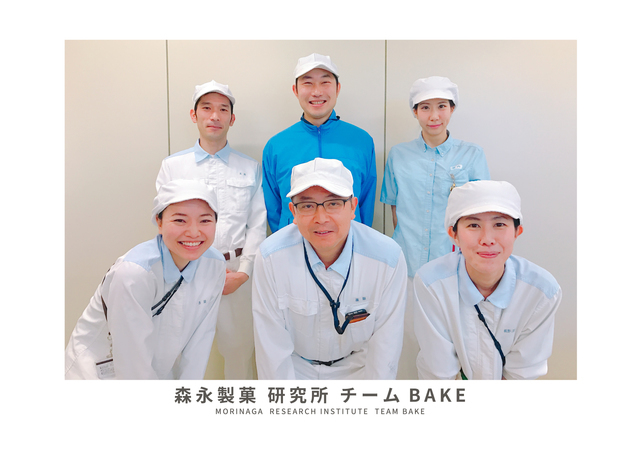 Since then, the baking technology unique to Morinaga has been updated for 14 years for better quality. This baking technology has three added values. Let’s have a look on each. Feature 1: Crispy outside, smooth inside: Exciting double textured layers. This is what makes it “BAKE”. You can enjoy a crispy and crunchy chocolate layer with silky smooth chocolate inside at the same time. To realize the double textures, the very top layer needs to be baked in short time before the inside get hard (See the figure below). After years of R&D, this has been achieved with oven selection as suitable and baking condition management technique. Material selection, mixing methodology, and couple of licensed technologies unique to Morinaga also contributed to the double textures. In addition, application of this technology will allow a proposed product to have a soft textured layer with fixed shape as different from “BAKE”. The baked surface layer has high heat-resistant that makes it not melt easily. 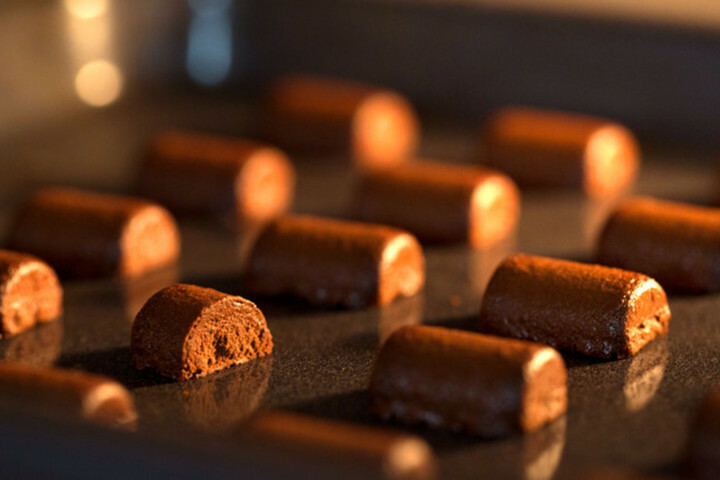 Although oily food products such as chocolate, butter and so on melt in high temperature, application of the baking technology makes it possible to keep the shape under such condition. 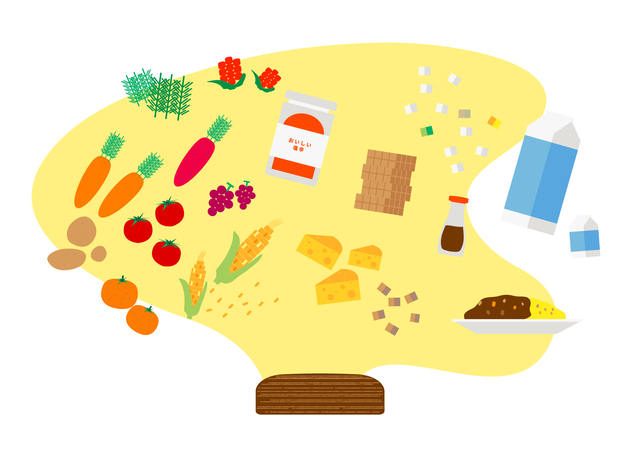 ※Oily food products also include peanut butter, curry cube and so on. Morinaga has high quality to create taste. 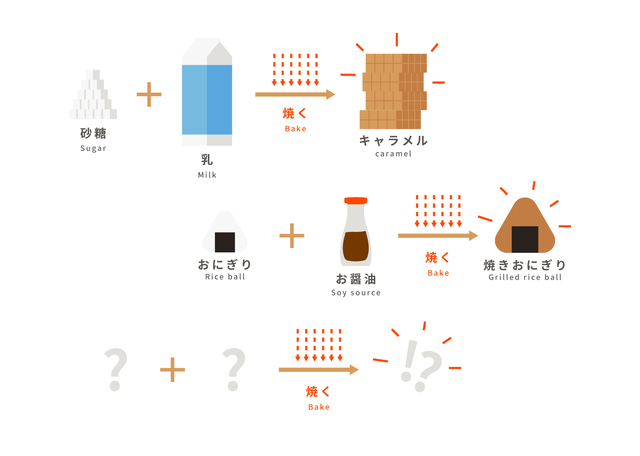 Liquid such as Mayo, Tsunamayo(tuna tasted with mayo), and corn soup can have a “shape” by transforming into oily food product. How exciting something like “grabbable corn soup” is! The technology will also allow you to enjoy the product almost any time and anywhere: held easily in using a smartphone, stored in car, suitable to a summer occasion. It may have a potential in any emergency occasion. Imagine caramel flavor, baked combination of sugar and milk, or Yaki onigiri (baked rice ball), a baked combination of a onigiri (rice ball) and soy source. One can be tastier after it is baked. You may know anything else that tastes better after it is baked. Use your imagination at this point and create idea for a new food product. 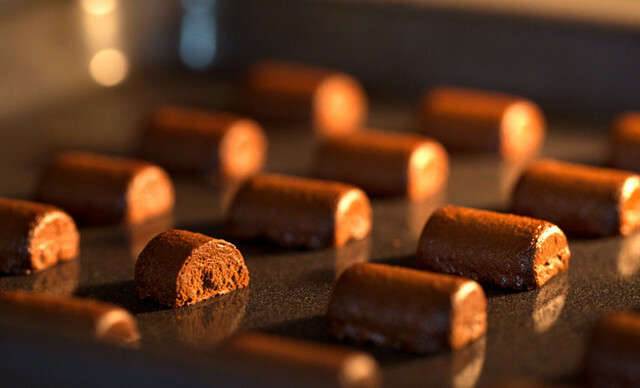 As mentioned above, this baking technology has potential not only to chocolate but also to variety types of food. Therefore, we’d like to have brand new food concept design to use this technology. You can offer an idea of snacks, not limited to confectionary. Probably it is better to use three elements as basics for this project to cultivate and form your idea. You can create variety of taste with Morinaga’s technology. As they already have BAKE Creamy Cheese Flavor, it is also possible to make it taste as tomato, corn soup, curry, consommé, Shiokara (salted fish)and so on. “BAKE Premium Raspberry Chocolate” captures juicy raspberry paste inside of the top layer. In the same way, you can put flavored source or paste of fruits, caramel or even something not sweet into the inside of its surface layer. “BAKE Cookie Chocolate” is a new sweet with another layer made from cookie covering baked chocolate layer. You can combine some materials with other materials like cookie, candy (surface on cream brulle), and cheese. If a proposed product requires any method where it is pushed from nozzle and cut in process, high productivity will be credited with lower range of expression in size and shape. On the other hand, mold production is available to credit higher range of expression with higher costs and lower productivity. You can choose either of these. This project is aimed at creating a mass popular product in retail shops in Japan. It is better to have a new and noticeable package, but be aware that it will be difficult to manage extraordinary high cost package. The deadline for product concept and design recruitment is February 14th of Ballantine Day. Works gathered during the recruitment period will be released on February 15th, the day after the deadline, and accept general voting. Based on the results of the voting and the opinions of the manufacturers, we will comprehensively review the adopted works and shift to product development. Please contact us on our chat form if you have any question. We look forward to your idea! Questions received from the attendants at the briefing session have been answered by Morinaga Corporation as below. Please definitely take these into consideration with your design! Q1: Is it difficult to bake a very cold food, such as ice cream? A: Ingredients which completely liquefy at room temperature like ice cream are difficult to bake. It might be necessary to replace it with viscous pasty food to some extent. Q2: Can you put ingredients? A: Yes. It can be puffs, nuts, crushed biscuits etc., but other solids are also possible as long as it is about 10 mm in size. Q3: Can you apply gradation or strength to texture? A: Since it is possible to add strength of eating texture to some extent by blending or baking chocolate, it can be made into a double texture like "outer crisp, inside smooth". When it gets even more complicated, delicate expression may be difficult because there is a limit to the sensitivity when eating in small size. Q4: Can it be shaped into everything? A: Basically, since it is cut from a long bar, the shape of the cross section can be made into a semi-circle or square. Although the productivity might drop, it is also possible to make other form (heart-shaped, star-shaped, pyramidal-shaped, etc.) by molding. Q5: Can you make an acute angle shape? A: If it is 90o, it is possible to some extent, but in if its acuter (for example about 60o), the corners might be rounded a little when baked. It seems to be difficult to keep the shape when it is sharper. Q6: Can it has a hollow inside? A: It is difficult to completely hollow like a hollow snack. (Because the shape collapses when baked). If it’s like donuts, it is possible to bake it in a shape that is flat in the center. Q7: If it is mixed with other things, can you bake it? A: It is difficult if it is with foods which have water ingredient (for example, ice or sorbet). It can be covered with technology that keeps its shape when melted, based on grease. If it is butter, there is a possibility of burning as it is if you add hands such as mixing a little solid. Q8: Do you put it inside a furnace when baking? A: Basically, it is baked in a continuous oven (an oven with a belt conveyor). The baking temperature and time can be changed. Q9: Can you bake without forming the outer texture? A: It is possible not to make the outer texture (or making it softer) by baking only the surface very thinly. Even if it is thin, the surface layer is already baked so it does not melt on your hand. Q10: If it is combined with candy, what would it become? A: Sometimes we put a crispy layer of candy like a creme brulee on top of chocolate. Q11: Will the texture also changes according to the shape? Q12: Can I overlay 3 layers, 4 layers and chocolate? A: Yes you can. We have already sold baked chocolate which has 2 layers. 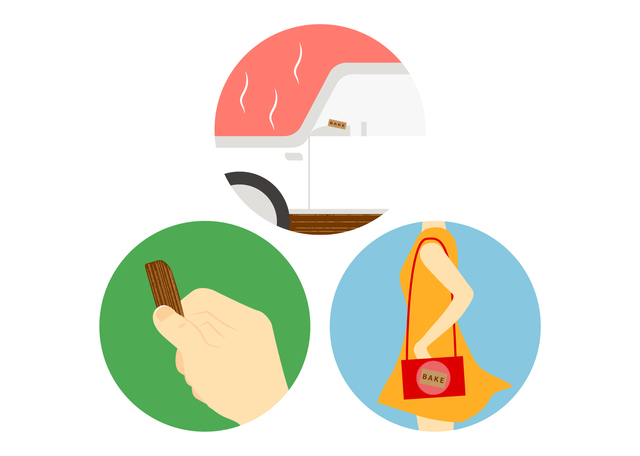 Q13: Is it possible to have a stick shape with sauce on it? A: If the viscosity of the sauce is high to a certain extent (eg: jam), it's okay. Q14: Is there any reason why ideas such as curry taste have not been commercialized? A: In the development as a traditional chocolate product, it was not adopted for reasons, such as the fact that the idea is leaping too far. But there is no need to worry about such a thing in this effort. I am waiting for a free idea. Q15: Are there any limits on the assumed price range? A: If the value as a product is reasonable, we do not consider limiting the price. Q16: Is it possible to make the texture nonuniform? A: Yes. It can be changed by sugar blending, baking method, hardness of grease, etc. Q17: Are there any raw materials that must be inserted? Q18: Is the cookie part of the confection combined with the cookie dough made from flour? A: Since the cookie part is almost the same raw material as conventional cookie, we use flour. Q19: Are there any raw materials that cannot be used? Q20: Are you sterilizing at the same time when you bake? A: Since we usually use raw materials that have already been sterilized, we do not think much about sterilization at baking. So, you can consider we bake it freely. Q21: What is the maximum size? A: Basically, the larger it becomes, it would be easier it is to crumble when baked, so there are restrictions. From past achievements, we have a track record up to 30 mm square cube size. If you add solids such as powder, you can get strength, but we will approach the conventional baked confectionery. Q22: Is it possible to have a double texture even if it is small? A: Basically, if it is smaller, it will be difficult to notice or to get the feeling. So, clear differences would be hard to understand. Q23: Do you use food additives? A: We use emulsifiers, etc. Q24: Is the scope of application limited to sweets? Q25: Will it be damp after you bake it? A: Especially if you put the cookie, it will be dampened to the same extent, like ordinary pottery. Chocolate parts and the likes are based on fats and oils, their changes in texture may be less than cookies and biscuits. 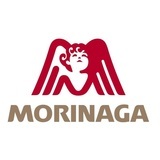 Morinaga and TRINUS jointly commercialize and pay the following fee. ◇ 100,000 yen if your design progresses to a product development stage. ◇ If it is sold as a nationwide distribution product of the Morinaga brand after the test sale by TRINUS, we pay the sales royalty up to 0.5% for 3 years (assuming the total amount is about 5 million yen in that case). * It is possible that more than one work may be adopted if it is judged that it can be commercialized. * Sales royalty is calculated by multiplying the manufacturer's wholesale price. * Sales royalty will be the maximum value (0.5%) if all the product concepts and designs posted are adopted as they are. In the case of partial adoption, we will judge the degree of contribution and set the ratio. * If it is 0.5%, the total royalty is expected to be about 5 million yen in 3 years from the past record, but it will increase or decrease depending on sales. ◇ Submissions must be made via this website as image files (JPG, PNG or GIF). ◇ Is not overly complex and can be manufactured and sold at a competitive/realistic price. Please refer to terms and conditions as stated on our website.